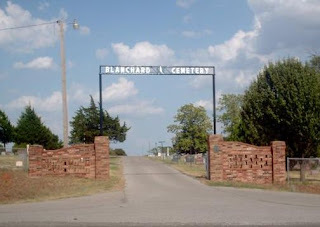 When I was searching for a haunted location in Oklahoma to feature on my Haunted America page, I kept coming across articles listing the alleged 'spookiest' haunts or most disturbing haunting cemeteries in the state...and Blanchard Cemetery always seemed to make the list! Although there isn't a whole lot of information about this particular haunting...its a neat story! By haunt standards, the Blanchard Cemetery, about 12 miles north of Norman, is fairly new. It was incorporated on October 19, 1917 and is still an active cemetery today, accepting new burials and being maintained by the Blanchard Cemetery Association. The sprawling acreage of the cemetery is divided into sections, and while the cemetery is quite large, it seems like the only section to be haunted is Section 2. Various websites state that if you enter the cemetery and come to the second section, you'll see a group of three trees. Stand to the left of the trees, and in the middle of this tiny grove, you're sure to see a spooky sight: a ghostly young man wearing black pants. This young man will stand there, with his hands in his pockets. If you're lucky, he may raise his hand to wave you over to him, although various commentators to different websites claim that to accept his invitation would surely be a ticket to demonic possession. You can tell that the young man is about to make his appearance by a ghostly light. It is said that right before he appears, witnesses have observed a bright bluish light, that suddenly goes dim. Others have heard unearthly noises right before the apparition makes itself known. Unfortunately, not everyone may see this spooky sight. A girl named Chelsea wrote in to the Ghosts of America website, claiming that SHE was the original reporter of the story, submitting her claims to the popular Shadowlands Index, where it was subsequently copied and pasted by a variety of other websites. Chelsea asserts that only teenagers are able to see the apparition, and that on subsequent visits to the Blanchard Cemetery, the young man in black pants had grown progressively more frightening, in once instance, brandishing a knife at the witnesses. Although I'd put money on the fact that this story is nothing more than a modern urban legend, it would be interesting to see if the young man can be tracked down. The cemetery's website offers an alphabetical listing of burials, which includes what section the plot is in. Just going through the As and Bs I found a few very early burials...and a few of young men who passed away. Could one of these be the young man...and if so, why is he still haunting the cemetery? Is he protecting the cemetery itself from potential teenage vandals, or is he protecting something more specific? Hopefully someone will do a little more research and possibly come to some conclusions. If you'd like to learn more, I suggest my article on cemetery guardians---people who were the first burial in a new cemetery who folklore denotes are chosen as protectors of that cemetery until Judgment Day.